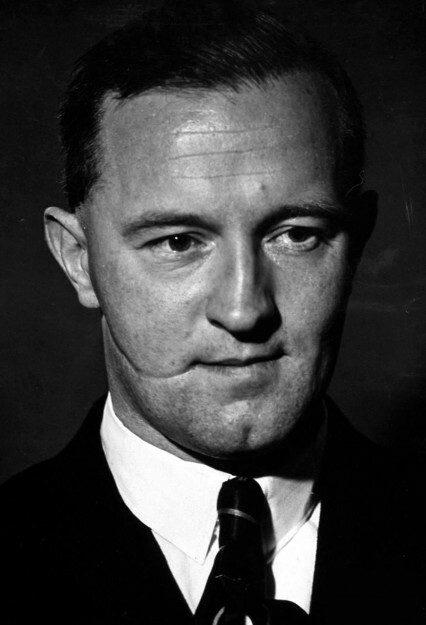 I've mentioned before that William Joyce, who as 'Lord Haw Haw' was the voice of the Nazis' English language radio broadcasts during the Second World War, had once been involved in the Conservative Party in Dulwich. I've been reading more about him in 'The Meaning of Treason' by Rebecca West (1965), who attended Joyce's treason trial at the Old Bailey. 'He came to London before his family; and his destiny sent him down to South London, and there was significance in that. South London is not the London where England can be conquered. It is not London at all, even calling itself by a vague and elided location. 'Where do you live?' 'South the river'. The people on the other bank never speak of their landscape as "north of the river". They may go down east, or up west, but they move within London, where the Houses of Parliament are, and the Abbey, and Buckingham Palace'. Joyce's first London home was in Longbeach Road SW11, 'in one of those streets which cover the hills round Clapham Common like a shabby striped grey counterpane'. While here Joyce began studies at Battersea Polytechnic. When his parents came to London afterwards he moved into the family home at 7 Allison Grove SE21, 'a house as delightfully situated as any in London. Allison Grove is a short road of small houses which has been hacked out from the corner of the gardens of a white Regency villa in the greenest part of Dulwich'. Ironically the house was destroyed by a German bomb early in the war: 'Nothing remained of it except a hole in the ground beside the remains of a neighbour's basement'. Joyce was active in the Conservative Party's youth wing, the Imperial Youth League and later the Tory Party proper. He was also involved with the British Fascists from 1923 to 1925, who provided security for Conservative Party public events - Joyce prided himself on being a street-fighter and claimed to have helped the notoriously brutal Black and Tans in Ireland in their efforts to suppress Irish nationalists. It was in this physical capacity that Joyce sustained his striking scarred face during a fight while defending the platform at a 1924 Tory election meeting at Lambeth Baths in Battersea. 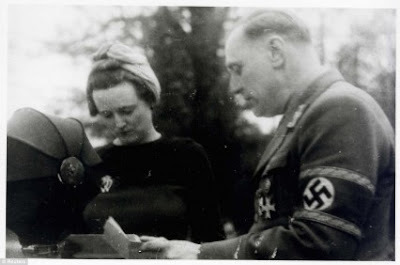 In 1927 he married and moved to Chelsea where he remained a Conservative Party activist until 1932 when he joined Oswald Mosley's British Union of Fascists. He subsequently became its Deputy Leader and Director of Propaganda. In 1933 he was back in South London, living in in Crystal Palace in 'a home which, though cheap and unfashionable, possessed its picturesque distinction. He was staying in a flat in a road clinging to the top of an escarpment in the strangest spot in the strangeness of South London. It was far south of the river, where the tameness of town overspreads hills which, though insignificant in height, are wild in contour; and if it covers them with the tame shapes of houses it has to stack them in wild steepness. But above this suburban precipice the buildings themselves were wild with the wildness sometimes found in Victorian architecture. Outside the windows of his flat in Farquhar Road, two towers ran up into the sky and between them the torso of the Crystal Palace was at one and the same time a greenhouse and a Broad Church cathedral... A little way up the road was the Crystal Palace railway station, the most fantastic in London, so allusive, particularly in its cast-iron ornamental work, to uplifting Victorian festivity that it wold not be surprising to find its platforms thronged by a choir singing an oratorio by Parry or Stainer.. It was from this flat, on 4 July 1933, that William Joyce addressed the application for a passport which cost him his life'. It was as a holder of a British passport that Joyce was later convicted of treason. His lawyer argued in his trial that he was technically a US citizen and therefore could not be guilty of treason to the British state, but Joyce had spent years arguing that he was British with the passport application the clinching evidence. Joyce split with Mosley in 1937 and founded the British National Socialist League, even more rabidly anti-semitic than the BUF. He moved to Germany just before the outbreak of war in 1939, and worked for the Nazi propaganda effort all the way through to their defeat in 1945. After being captured and brought back to England, Joyce was detained in Brixton prison, Wormwood Scrubs and finally Wandsworth, 'a shabby old prison, black as a coal tip, set among the trodden commons and the discoloured villas, the railway viaducts and the long streets of little houses, which lie "south of the river". The last days of his life in London were to be spent only a mile or two from the house in Longbeach Road where it had begun'. He was hanged for treason in January 1946. Incidentally Joyce's daughter Heather Piercey ended up teaching in Deptford, trying to atone for his anti-semitism by promoting links between Christians and Jews (see this 2005 interview). (See also Nickel in the Machine - The Execution of Lord Haw Haw at Wandsworth Prison in 1946, from where I sourced the photos). In a former life I worked at Radio Luxembourg (208, your cheerful earful) from time to time. One of the DJs, Bob Stewart, showed me huge 78s he'd found in the basement of the RTL building. They must have been over 2' in diameter. They were played starting from the inside near the label. They were recordings Joyce made. and were broadcast to Britain via the Luxembourg transmitter. "Some believe the traitor ‘Lord’ Haw Haw helped the raiders to pinpoint them, as he once lived in Bickley, and mentioned Bromley in his Nazi broadcasts. " and this is also mentioned in a book called "Bromley - A History and a Celebration" by John Ruler. It must have been between 1933 and 1939 that he lived in this part of Bromley. Strangely dissonant views of south London are commonly held by those excluded from the Elysium that is Herne Hill, Dulwich, Sydenham and Norwood Junction. At which point one is tempted to stop reading. Anyway some time ago he bravely ventured south into this terra incognita to give a talk at the Dulwich Picture Gallery on the subject of PGW and the audience of landladies and servants patronised him right back I can tell you. I think someone stole his pith helmet. Interesting article. I can remember when I was about 6 or 7 (early 1950's) having a modern semi-detached house in Underhill Road (or Woodvale) identified by may grandfather as where Lord Haw Haw lived. Pehaps this is where he lived during the weeks just before his arrest/execution as mentioned in the article. It is not far from the other Dulwich address, but I cannot identify the house on Google Earth...It had a red door though.